I have a large Rubbermaid-type storage container covering my kitty's litter box in my storage room. She used to kick litter all over the place. Now I have much less to sweep up, plus it looks much more pleasant for company. Turn the container upside-down and cut a doghouse-style opening in either the broad side or the end. 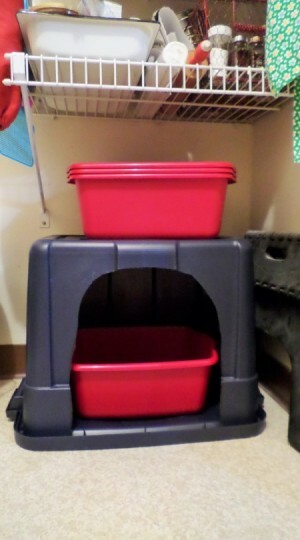 Having the opening on the end will make an even more enclosed and private litter box. Use either a box cutter or strong shears, but be careful the plastic can be very tough. Once you've cut the opening, lay the lid on the floor. Place the box on top of it and snap the inverted container back on the lid. It only takes a few dollars and a few minutes to make a piece of furniture that is completely washable and will last practically forever. I don't have cats but this looks like a fantastic idea! I'll pass it on. Thank you, Marty. It has been very helpful to me. I've got 2 cats and a basement covered in litter dust. Thanks for the idea! If you don't want the litter box to smell, mix in some Arm and Hammer baking soda (or the storebrand). And people won't be able to tell you have a cat even if your guest can see the litter box in plain site. I added a little baking soda to my clay litter and my cat Goldie started chewing on her feet. I stopped adding it and she stopped chewing her feet. I plan to try this as my home project thus week! I have a large kitchen and have 2 litter boxes and would like to keep them more hidden from view.